Sida hermaphrodita or Virginia Fanpetals: a new player in the biofuel game. When it comes to biofuels, especially the sort of biofuel that gets used for ethanol, there’s always a bit of an issue. You see, it kind of defeats the purpose of having a sustainable fuel source if you have to pour on truckloads of fertiliser (a lot of which can come from petrochemicals as well) and tons of water. It’s also rather frowned on if the crop in question takes away land from something that could be used for growing crops that people are going to eat directly (as vegetables, flour, cooking oil, sugar, etc.) or indirectly (after a fodder crop has been fed to animals that produce milk, meat or eggs). Now, we’re not doing too badly over here in Australia on the biofuel ethanol front, as we’ve got the sugarcane industry. Using residues from other crops is a tried and true means of sourcing ethanol feedstocks, with sugarcane residues being particularly good at it. In fact, Brazil, which has a bigger sugarcane industry than we do, is a tad further ahead when it comes to using ethanol for everyday driving. Other sources include residues from wood processing and residues from the alcohol industry (they’re doing this in the UK). Apparently, the trick is to find the right methods and the right bacteria, etc. that will break your feedstocks down so it can be turned into ethanol. However, the search is on around the world for novel feedstock crops for biofuels of all types (this includes the crops that can produce oils for turning into biodiesel as well as the ones that have suitable stems or whatever for turning into ethanol). The ideal crop is something that grows easily with minimal input needed in the form of fertiliser and pesticides, doesn’t need people poking around with tractors much except during harvest, doesn’t demand water like a camel that’s been for a week in the desert and produces the three Fs: Food (for humans), Fodder (for animals) and Fuel. 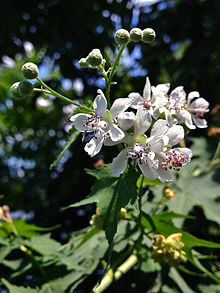 One of the new players on the biofuel crop front is a plant that looks a bit like a common weed known as Virginia fanpetals, Virginia Mallow or Sida (its Latin name is Sida hermaphrodita). This is a native of the US but for some reason, it’s getting a fair amount of interest from a team in Eastern Europe because it doesn’t demand the same amount of water as elephant grass (Miscanthus), which is another easy-growing biofuel feedstock. What’s more, they’ve found that it’s a triple-F plant if you want to get technical. The plant has lots of flowers that are very attractive to honeybees, so the Food part of the equation comes in the form of the honey produced that way. The leaves, when they’re green, are pretty nutritious for animals. And when the plant is dry, the whole lot, stems and leaves, are great for biofuel (and they also burn cleanly in incinerators, making them an alternative to coal for generating electricity). Sida is also tough as old boots, as it grows very happily on sandy soils and can handle drought and frost perfectly well. It also has a feature that would make it a right pain if it established itself in your garden: if you cut it back to ground level, it comes back again next spring and will do so for 15–20 years. This is what’s getting those researchers rubbing their hands with glee: no ploughing, harrowing or sowing. Just a bit of fertiliser a couple of times a year and you get a crop year after year. And it grows on the sort of ground and in the sort of conditions that are useless for, say, potatoes, wheat and carrots. In other words, it looks like it could be a bit of a winner. Can we grow it over here and make even more of our own biofuel? However, finding out about this got me thinking. Now, we all know that we’ve got unique plant life knocking around in the Outback that’s used to really harsh conditions. Are they any good for biofuels? Is there something sitting out there that could be the next big thing? I really, really hope that there’s a nice CSIRO research team poking around to see if there are any native plants that could do the trick. Bioethanol isn’t the only way forward, of course. It’s one of three possible lanes on the sustainable motoring highway, with the other two being electricity and biodiesel. And we shouldn’t forget the biofuels while we get all excited – rightly – about the new electric vehicles. After all, classic car drivers, tradies, tractor drivers, truckies and the owners of hybrids all need something to put in the fuel tank!